In this, the second in our series of Remarketing blog posts, we’re looking at how to create a Remarketing Audience within Google Analytics and link it to your Adwords account. If you missed the first blog post in the series, read it now and get caught up! Creating a Remarketing Audience within Google Analytics is pretty simple – the interface guides you through each step of the way. The hardest thing to do is decide on the people you want to target. – Are they people who’ve been on your website but not converted? – Are they people who’ve placed something in their basket but not completed the checkout process? – Are they people who’ve visited the sign up page of your site but didn’t create an account? These are basic examples but you can make it much more targeted if you want – for example, mobile users from a specific country who landed on a certain page AND didn’t convert? No problem – we can do that too. To create your first Remarketing Audience, log into your Google Analytics account, click on ‘Admin’, then under ‘Property’ for the relevant account, select ‘Remarketing’ and then ‘Audiences’ (see below). On the next screen, click on ‘New Audience’. From here, you’ll need to select the relevant Google Analytics ‘view’ – if you want your audience to reflect goals or filters, pick the appropriate view here – in most instances, you’ll simply want to pick your main/default view. In the ‘Destination account’ box, pick the corresponding Google Adwords account that you want to use your Remarketing Audience with. Once you’ve done this, it’s on to the next step. At this stage, you have to define your audience. Google Analytics gives us a list of Recommended Audiences which are largely set up for you already and good to go. If you select ‘Users who visited a specific section of my site’ or ‘Users who completed a goal conversion’, you then have to further define the rule by either selecting the specific goal or URL(s) you want to be included in the audience. You can, however, use the Audience Builder to create much more complex conditions using the variety of options available – it’s possible to create just about any combination of conditions and turn them into an Audience. Once you’ve finalised your Conditions, hit ‘Apply’, give your Audience a name and hit ‘Save’. You’ve just created your first Remarketing Audience, which will be available within your Google Adwords account for use! Note: If none of the Recommended Audiences meet your requirements, you can also hit ‘Create New’ (on the ‘Define Audience’ screen shown above) and build an audience from scratch using the Audience Builder. 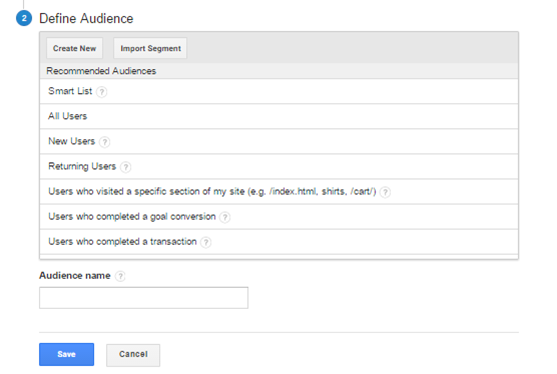 It’s also possible to import a pre-existing Advanced Segment from your Google Analytics account. Don’t forget to come back next week for the final instalment of our Remarketing series where we’ll be looking at real-life examples of how remarketing can work successfully and drive sales. If you’ve got any questions on any of the above, feel free to leave a comment below and we’ll do our best to help!